- Adopt single rope main winch, effectively solving the wear problem of the steel wire rope and improving its service life. – Install the infrared camera, which can observe the service condition of the main winch steel wirerope in the cab day and night. – Many configurations can be installed according to the customers’ requirements (such as: landing leg cylinder, automatic slew). – Adopt imported Cummins electronic control turbocharging engine, meeting the Europe III emission standard. It is energy-efficient and environmental friendly, and has strong power. – The hydraulic system adopts limiting power control and positive flow control, which improves the efficiency of the hydraulic system and saves more energy. – The patent parallelogram variable structure realizes the large-scope working area. The mast is designed to be the box-type structure, which has high intensity and rigidity, effectively ensuring the drilling preciseness. 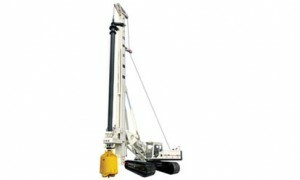 – It can be attached with 5 drill rods. The maximum drilling depth can reach 67.5m.